Akram Khanâs âXENOSâ begins pleasantly, with a concert of Indian classical music in progress as the audience walks in. The sound and the colors are warm, enveloping; the vocalist Aditya Prakas and percussionist BC Manjunath sit on the floor of what looks like a lavish living room. But periodically lightning seems to strike the stage, and static drowns out their music, foretelling the struggle and isolation to come. âXenosâ is Greek for stranger or foreigner, and in this affecting but at times overbearing work, which had its United States premiere on Wednesday at the White Light Festival at Lincoln Center, Mr. Khan embodies a lost, tortured soul. 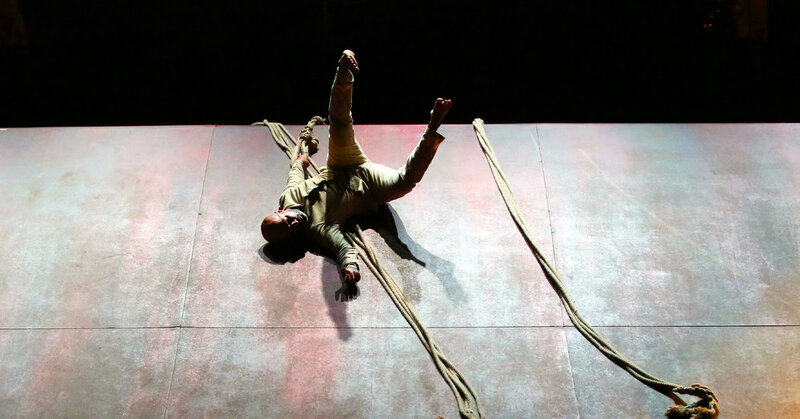 Billed as his final full-length solo â he is 44 and, understandably, ready to give his body a rest â the show draws from stories of the more than one million Indian soldiers enlisted by the British in World War I. In an interview in the program, Mr. Khan, who grew up in London with Bangladeshi parents, said he was shocked to learn of these soldiers only a few years ago, that he hadnât known this part of history. âThe untold stories need to be told,â he said. His character appears to be a dancer forced into war. In the opening scene, Mr. Khan dances alongside the musicians, juxtaposing elements of Kathak, North Indiaâs classical dance form, with less elegant stumbles and falls. From Kathakâs swift spins and rhythmic footwork, joyous in other contexts, he wrests confusion, rage. When he unwraps his ankle bells, holding a strand in each hand, they resemble chains. At its best, âXENOSâ transmits a sense of relentless uncertainty, raising the question of whether death, under certain circumstances, might be better than living. Yet the workâs melodrama, as Mr. Khan staggers, shell shocked, through this hostile space, undercuts its power, particularly in the final scene. A more poetic potential end comes just before: The stage has emptied, Mr. Khan has disappeared, and a gramophone â doubling as a searchlight â scans the darkened theater, shining into the unknown.